The Five Points West Library is hosting a series of free workshops and events November 7–9 in celebration of 2018 Veterans Small Business Week. This is part of a national celebration honoring our veterans leading up to Veterans Day, which will be observed this year on Sunday, November 11, 2018. Schedule one-on-one 45-minute sessions throughout the day. Call the Five Points West Library at 205-226-4015 to get a list of available times. 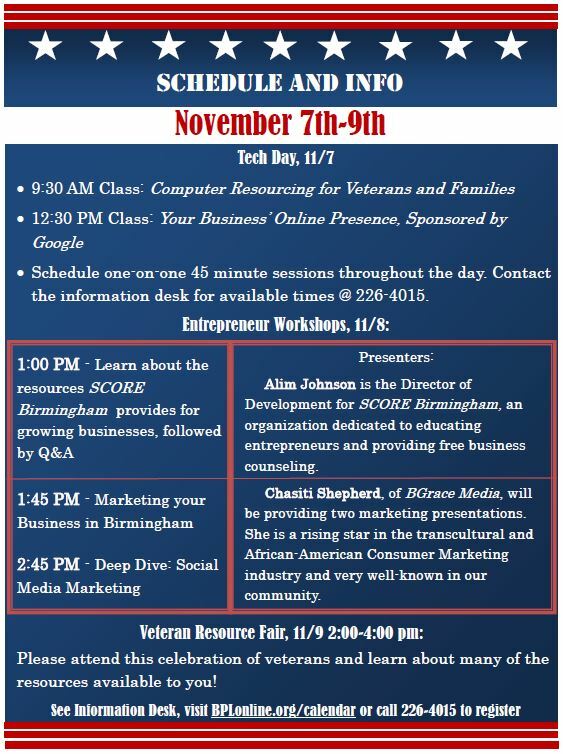 Alin Johnson, director of development for SCORE Birmingham, talks about the free resources that SCORE (Service Corp of Retired Executives) offers for entrepreneurs, including free counseling. Both of these marketing workshops will be led by Chasiti Shepherd of BGrace Media. Veterans and their families are invited to visit with Birmingham area agencies sharing details about resources available to assist them. Google is helpful for a lot of things and for giving a lot of answers. However, Google can make it difficult if someone is searching for a legal form. In general, most legal forms are state specific, and most of the time, it is difficult to tell if you found it from a reliable source. Sometimes, you might have found that perfect legal form on a website. You fill out all your information, and everything looks great. But then, when you try to print or save it, the website lets you know that, by the way, you will need to pay us money to use this form. As you can imagine, it is a pretty frustrating experience. The Birmingham Public Library has access to a database called Alabama LegalForms. If you have a simple matter, such as a bill of sale or a residential lease, you should be able to find what you are looking for on Alabama LegalForms. You can save yourself some time and potential heartache down the road by using these forms rather than relying on verbal agreements that can lead to misunderstandings and disputes. The site also includes forms for more complex issues as well, such as divorce, power of attorney, wills, or bankruptcy. All these forms are freely available to you as a Birmingham Public Library patron. It is very important to remember that your friendly library staff are not attorneys and cannot tell you what form to fill out. Alabama LegalForms is no substitute for the counsel of an attorney. However, we are more than happy to show you how to access the site and how to search for the forms. 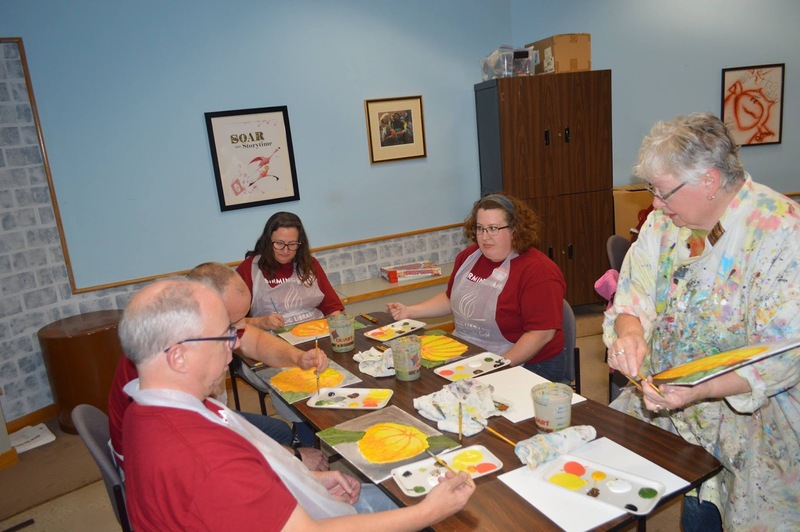 November is right around the corner, and the Titusville Branch Library is encouraging our adult patrons to embrace the autumn season by participating in a make-and-take craft program. 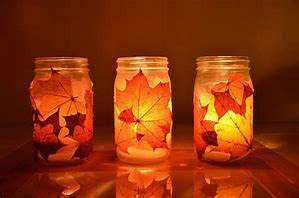 On Wednesday, November 7, at 10:00 a.m., the library will present a class in which participants will create their own fall-themed candles. All supplies will be provided by the library, and this event is free (although registration is required). 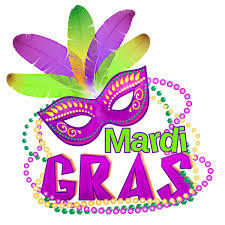 You may register online through the BPL events calendar or by calling the library at 205-322-1140. There are still some available slots, so if you’d like a chance to explore your artistic side, register today! As a boy, all I wanted was to draw a family tree. I never imagine, as I transcribed all the names and dates Grandma dictated . . . that one branch of my ancestry would lead me to this gigantic building collapsing in flame. I never imagined that I would become obsessed with unpuzzling what really happened, and why, and that the only way for me to behold the truth was to tailor anew the ghoulish raiment in its entirety. For that is precisely what I had to do: piece together the historical context of this family story . . . how else could I identify suspects and motives, and evaluate them, and determine who was innocent and who was guilty? 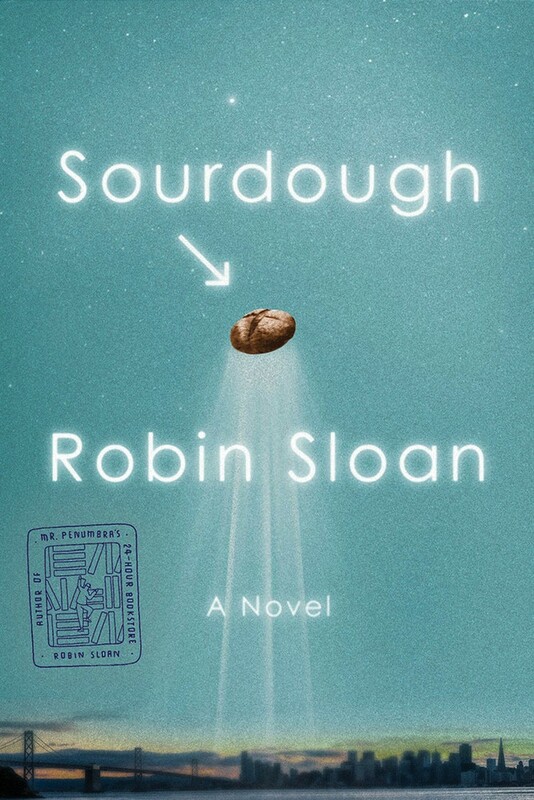 All of this sounds like a daunting task, but the bits and pieces of family lore were enough to set the author on the trail as relentlessly as any Sherlock Holmes, except that this is not fiction—the lure of discovering the facts is the driving force in this account and serves as an example of the surprises that may be in store for anyone researching family history. 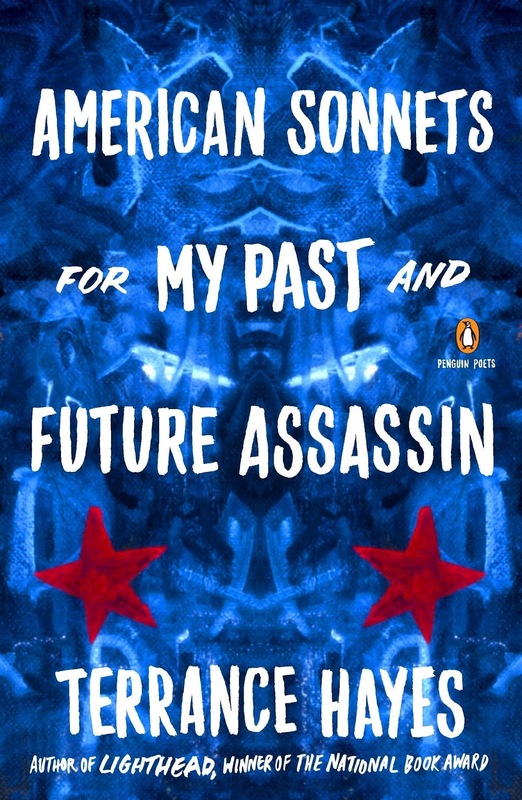 Most of us have heard these kinds of stories about our forebears—there’s a tale about one of my ancestors and Davy Crockett that I’d love to be able to prove—but few of us would have the patience and determination to dig so deeply in search of the truth or write such an absorbing account of the facts. 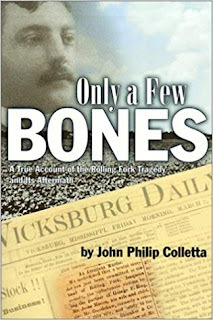 I once had the privilege of hearing Dr. Colletta lecture on how he came to write Only a Few Bones. He began his presentation in the morning and made us wait until after lunch before he revealed his findings . . . the truth about what really happened in Rolling Fork that night. There was no need for a nap that afternoon—we were all wide awake! Still, in the end, it would amaze me how much of what Grandma repeated to me on blind faith turned out to be factual.—But factual in a deceptive way, a smattering of misshapen pieces of the truth, jumbled and insufficient. Stitched together, they would never add up to a whole garment. So Grandma never knew, as I know now, how truly terrible it was. Only a Few Bones should be required reading for anyone who wants to write a family history; sometimes all we have to go on are fragments of half-remembered accounts that are like scattered bones, but Colletta’s riveting account of his years of research and how he uncovered the real story of the Rolling Fork incident is a prime example of how to do it right—how to assemble the bones into a body of evidence that will bear close scrutiny. 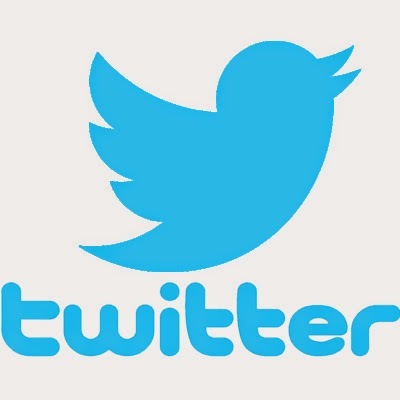 If you have a taste for history or genealogy or true crime or all of these together, this account is not to be missed. 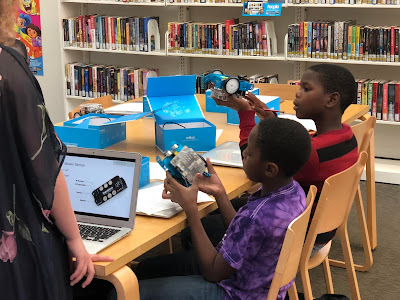 Teens Engineer BHM, a partnership between the Birmingham Public Library (BPL) and The University of Alabama at Birmingham School of Engineering, continues to offer free activities for middle and high schoolers with a passion for engineering at several BPL locations through the end of November. 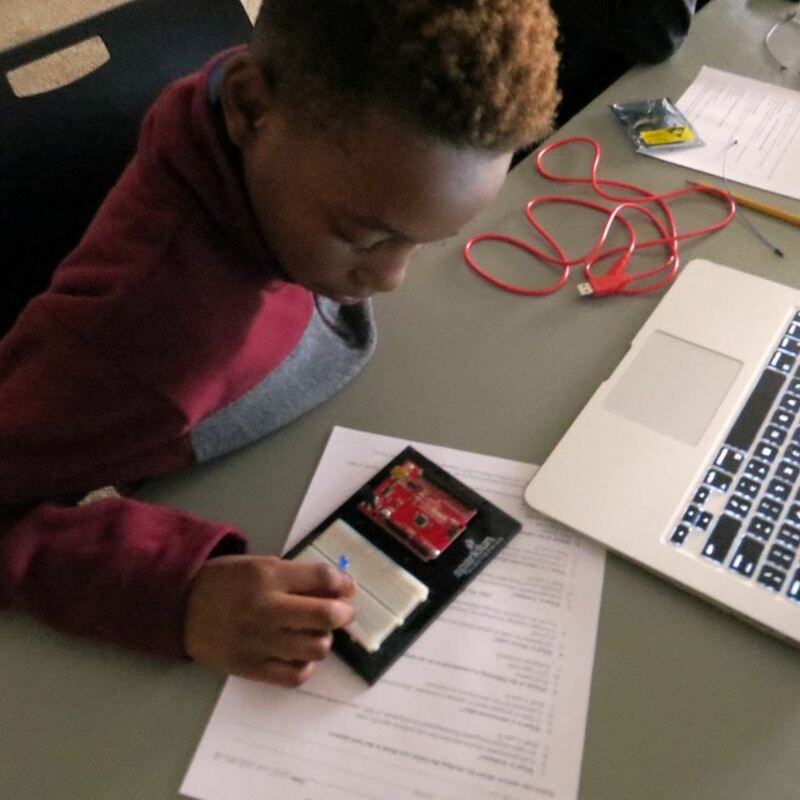 The free program is teaching young people how to program robots, soldering, and computer coding skills at 12 of BPL’s 19 locations: the Central Library, Avondale Regional Branch Library, North Birmingham Regional Branch Library, Five Points West Regional Branch Library; and eight branch libraries: Ensley, East Ensley, North Avondale, East Lake, Southside, West End, Smithfield, Inglenook, and Powderly. 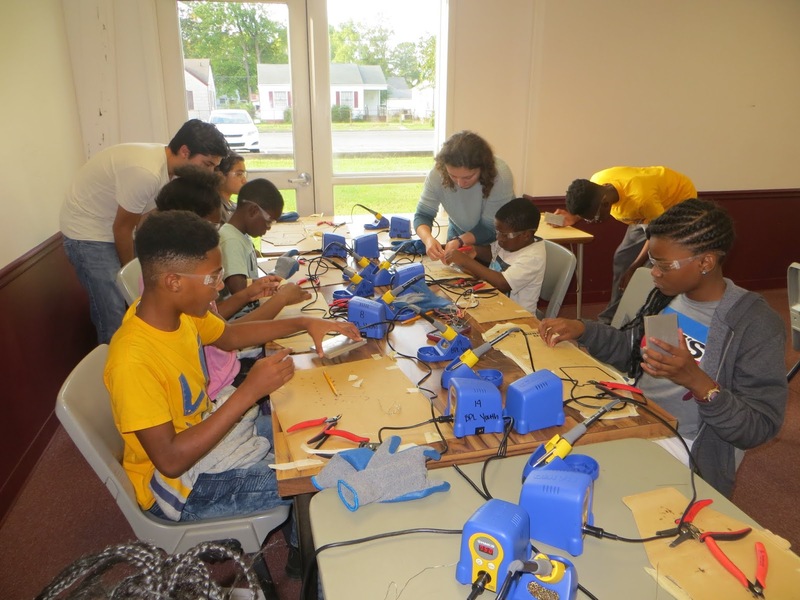 Teens Engineer BHM is a past recipient of a $95,000 grant from the Community Foundation of Greater Birmingham and a $50,000 grant from the UAB Benevolent Fund. Learn more about Teens Engineer BHM. Visit the BPL event calendar for more information on these programs. The Birmingham Public Library is helping our patrons get in the Halloween spirit. Besides candy give-aways for young patrons at most of our 19 locations across Birmingham on Wednesday, October 31, 2018, there are plenty of free activities for patrons of all ages taking place all week. Programs include a Harry Potter Party at Smithfield Branch Library, Mardi Gras murdery mystery program for adults at Five Points West Regional Branch Library, Spooky Science Family Night program for kids at Avondale Regional Branch Library, Halloween crafts for kids at North Avondale Branch Library, and edible Halloween treat-making activities at Wylam Branch Library and Inglenook Branch Library. Ensley Branch Library and Southside Branch Library are also hosting “count the candy in a jar” contests in which the person guessing the closest will win prizes. Family Night: Spooky Science, Tuesday, October 30, 6:30–7:30 p.m.
Join Avondale Library for a night of spooky science as Ms. Jan (The Science Lady) presents an evening of "bubbling, oozing, gooey good fun" you won't soon forget. Halloween costumes are welcome, but please leave scary masks at home. Free but advance registration required. Tot Time with Mrs. Eve: Trick or Treat! Monday, October 29, 9:30–10:30 a.m. and 11:00 a.m.–12:00 p.m. Wear your non-scary Halloween costume for a non-scary Tot Time filled with stories, songs, and lots of trick-or-treat fun for everyone. Storytime is designed for 2- to 4-year-olds with a parent or caregiver; no groups, please. Free but registration required. Build and design a haunted house with flashing lights and moving doors. Monster Mash, Wednesday, October 31, 3:30 p.m.
Join the Central Library Youth Department for fun activities including humorous Halloween-themed movies, crafts, and face-painting. Visit Ensley Branch Library and guess how many pieces are in the candy jar. The person closest to the real number will win a prize. Sunday, October 28, 2018, 2:00–6:00 p.m.
Monday, October 29, 2018, 9:00 a.m.–4:00 p.m.
Get ready for the Triwizard Tournament with a Harry Potter movie marathon! Drop in whenever you can to witness the magic! 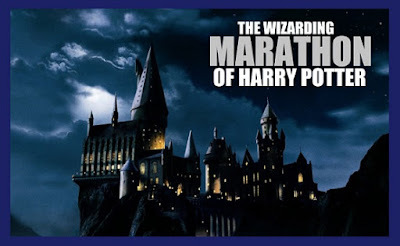 Harry Potter Triwizard Tournament, Monday, October 29, 2018, 5:00–7:00 p.m.
Join Five Points West Library to kick off Halloween week with a Harry Potter treat! This program is designed for families with children of all ages. Families in attendance are asked to come dressed as their favorite Harry Potter character. Free but pre-registration is required. Mardi Gras, Masks, Murder Mystery, Wednesday, October 31, 10:30–11:30 a.m.
“Make It, Eat It” Halloween crafts, Friday, October 26, 3:30 p.m.
Young patrons will make tasty, edible witch hats. Also join us on Halloween for free candy and Halloween coloring sheets. Halloween Crafts & Candy Treat Bags, Wednesday, October 31, 3:30 p.m.
Join North Avondale Library on Halloween for fun afterschool crafts, candy treat bags, and refreshments, all while being entertained by “spooky music” all ages can enjoy. Harry Potter Party, Wednesday, Oct. 31, 3:30 p.m.
Join Smithfield Library for Harry Potter-themed games, snacks and a free showing of the film Harry Potter and the Goblet of Fire. Costumes are welcome, especially Muggle costumes! Smithfield Library will be transformed into Hogwarts for an afternoon of fun for little witches and wizards! Drop by the Southside Library during operating hours and guess the number of candies in the jar. Make one guess per day. 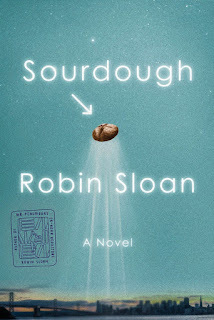 The winner will receive books and a gift card from a local restaurant. Let's Get Crafty, Wednesday, October 31, 3:30–4:30 p.m. This weekly afterschool craft program for kids will focus on fun Halloween activities. Edible Halloween Craft, Wednesday, October 31, 3:30 p.m.
Join us as we make tasty, Halloween treats. 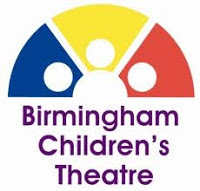 The Birmingham Public Library (BPL), in partnership with the Birmingham Children’s Theatre (BCT) and Junior League of Birmingham (JLB), invites you to attend From Page to Stage: Peter Pan – A Readers’ Theater Workshop for Children. In anticipation of the upcoming BCT performance of Peter Pan, BPL will be hosting free workshops at several of its area libraries. Children, aged 7 to 12, will learn how stories come alive through the magic of theater. JLB members will coach the children and introduce them to similar literature located in their local library. 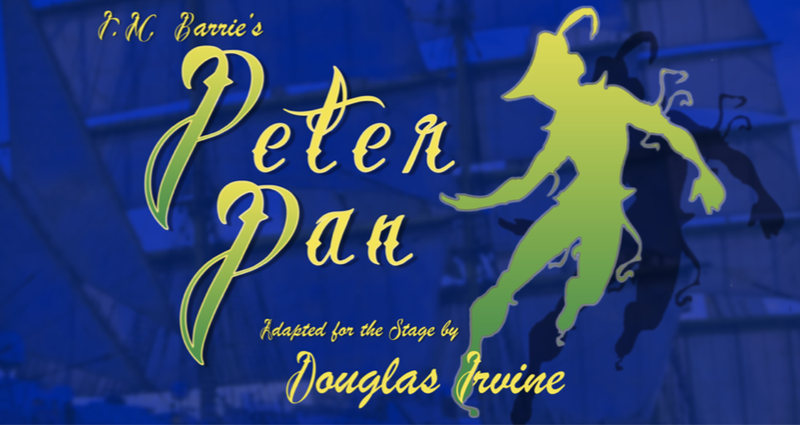 Each child will receive two free tickets (one child and one adult ticket) to the BCT Peter Pan production on December 8 or 9, 2018. This fresh adaptation of the classic J.M. Barrie tale has everything you love—Wendy and the Lost Boys, the dastardly Captain Hook, and the boy who never grows up. Let your imagination soar as—through the magic of shadow puppetry —Peter Pan and his friends sail through the night sky to Neverland. Daring sword fights, tricky fairies, and a very hungry, ticking crocodile await in a spectacular production that's perfect for the holidays. 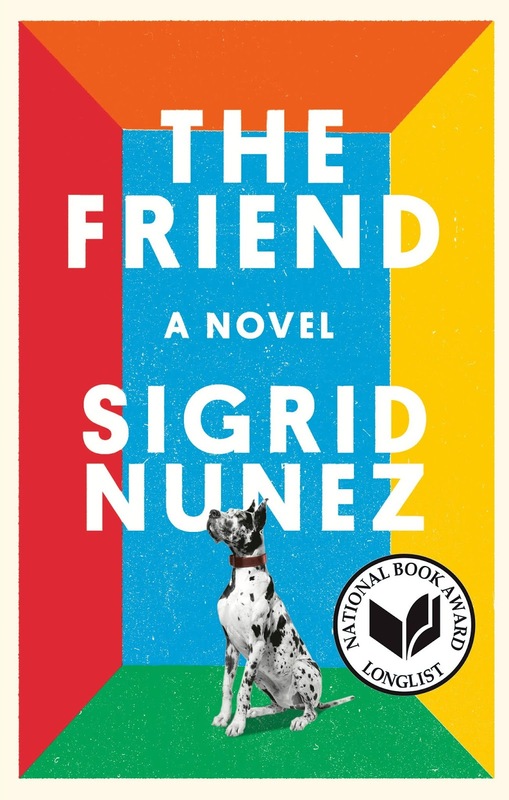 East Lake Branch Library: Saturday, November 3, 2:30 p.m.
Avondale Regional Branch Library: Sunday, November 4, 2:30 p.m.
West End Branch Library: Saturday, December 1, 2:30 p.m.
Five Points West Regional Branch Library: Sunday, December 2, 2:30 p.m.
One source that can give additional insight into our ancestors and their lives is church records. Given that most states did not require the registration of births and deaths until the early 20th century (1908 in Alabama), church records have the potential to help genealogists break through the dreaded “brick wall.” Many churches kept records of those joining and leaving, baptisms, marriages, and funerals. If you don’t know which church your ancestors attended, family tradition and country of origin can help get you started. Do a little research into the history of the community in which they lived. 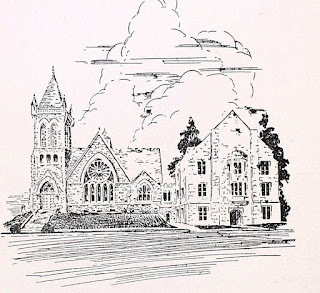 County histories are wonderful resources for documenting early houses of worship. Without realizing it, you may already have documents that give clues to your ancestors’ faith. Obituaries and wedding announcements may mention a church by name. Marriage licenses often list the name of the officiant. If that person is a minister, look them up in city directories, local histories, or census records to see what church they were affiliated with. Many churches publish histories to mark a milestone anniversary. The Birmingham Public Library's Southern History Department has a robust collection of local church histories. Often, these books include names of the founding members, early church officers, pastors, and photographs of important events in the life of the congregation. If your ancestor was a member of the clergy, the library has numerous biographical and ministerial directories that will help you, such as Brief biographical sketches of some of the early ministers of the Cumberland Presbyterian Church, and the Ministerial directory of the Baptist churches in the United States of America. To learn more, join us Sunday, October 28, in the Central Library Arrington Auditorium at 2:30 p.m. for a workshop on church records and histories as a genealogy resource. This workshop is part of our programming for Family History Month and is free of charge, but registration is requested. To register, call the Southern History Department at 205-226-3665 or visit the BPL events calendar. 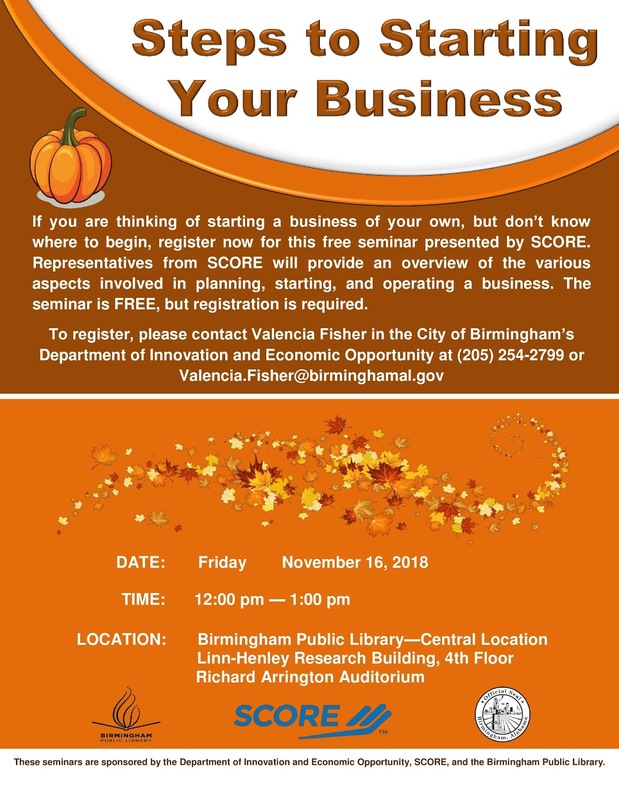 The Birmingham Public Library, in conjunction with SCORE (Service Corps of Retired Executives) and the City of Birmingham’s Department of Innovation and Economic Opportunity, will be hosting the monthly seminar Steps to Starting Your Business on Friday November 16, 2018. The seminar is scheduled to be held from 12:00 to 1:00 p.m. in the Arrington Auditorium, which is located on the 4th floor of the Linn-Henley Research Library. Topics to be covered in the seminar will include crafting a vision statement, identifying sources of funding, determining the legal structure of your business, devising a business plan, and investigating sources of business and economic information. Please register for the seminars by contacting Valencia Fisher in the Department of Innovation and Economic Opportunity at Valencia.Fisher@birminghamal.gov or 205-254-2799. 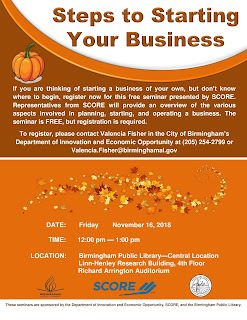 For further information about the seminar or about resources available at the Birmingham Public Library relating to small business development, please contact Jim Murray in the Central Library’s Business, Science and Technology Department at jmurray@bham.lib.al.us or 205-226-3691. Details: For Freedoms – Alabama is free and open to the public during Central Library operating hours. Call 205-226-3601 for more information or visit www.forfreedoms.org. The Birmingham Public Library (BPL) is hosting a new art exhibit that is part of a non-partisan, nationwide campaign using art as a means to inspire civic participation by celebrating freedoms in advance of the 2018 midterm elections. 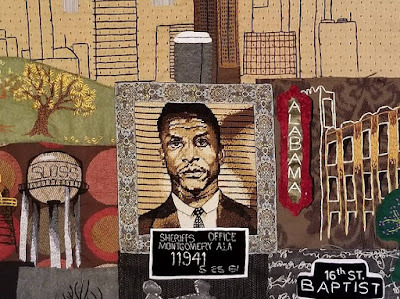 For Freedoms – Alabama will open on Sunday, October 28, 2018, in the Central Library Fourth Floor Gallery and be free and open to the public through Friday, January 25, 2019. Curated by Paul Barrett, the exhibit includes paintings, photographs, prints, and mixed media works from Alabama artists: Lanette Blankenship, Becky Delgado, Carey Fountain, Frances Hackney, Ira Hill, Josh Hoggle, Angela Hollowell, Devonte Holt, Holland Hopson, illartpeace; Kiante Johnson, Tara Stallworth Lee, Leanna Leithauser-Lesley, Elizabeth Limbaugh, Erin London, Meghan Malone, Isaac Nunn, Amber Quinn, Meroe Rei, Jared Ragland, Carl Schinasi; Don Stewart, Chris Wade, and Collin Williams. Barrett said after working with BPL on his One In Our Blood collaboration with the Abroms-Engel Institute for the Visual Arts, Birmingham Civil Rights Institute, Birmingham Museum of Art, and UAB School of Medicine last year, it was important to bring this new discussion between Alabama artists and the public to the Fourth Floor Gallery. For additional information about For Freedoms, visit www.forfreedoms.org and follow the 50 State Initiative on Instagram and Facebook. For Freedoms was founded by artists in 2016 as a platform for civic engagement, discourse, and direct action in the United States. The exhibit was inspired by Norman Rockwell’s 1943 paintings of the four universal freedoms articulated by Franklin Delano Roosevelt in 1941—freedom of speech, freedom of worship, freedom from want, and freedom from fear. For Freedoms uses art to deepen public discussions of civic issues and core values, and to clarify that citizenship in American society is dependent on participation, not ideology. The 50 State Initiative (including Washington D.C. and Puerto Rico) is the largest creative collaboration in the history of this country, with For Freedoms’ 200-plus institutional partners bringing together artists and community leaders across the country through exhibitions and town hall meetings, and public billboard projects. 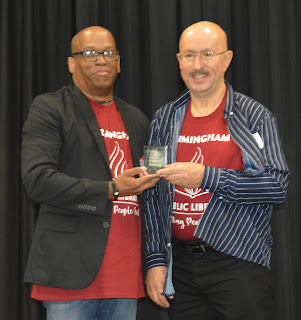 Birmingham Public Library (BPL) Executive Director Floyd Council awarded the inaugural BPL Staff Awards to several employees, as well as Best All Around Library and Best Branded Program of the Year during the 2018 BPL Staff Day held Thursday, October 18, at the Central Library. This award is to a library location that demonstrates exceptional all-around public service, community engagement, programs and sustainable partnerships. This award is for exemplary service and impact for 20 plus years in a leadership role. This award is for substantial archival and preservation work that sustains BPL heritage. This award is for the best project management of special events, system-wide initiative. 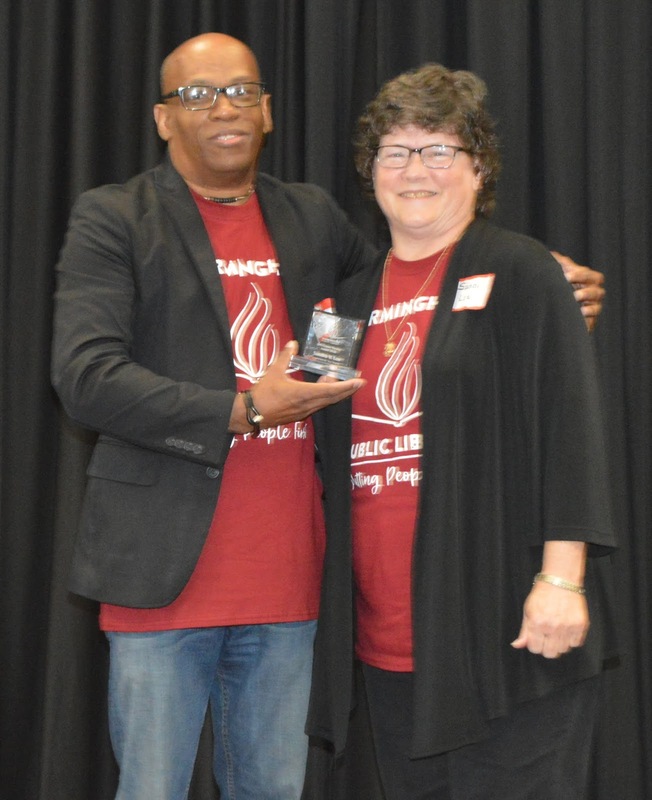 This award is for demonstration of exceptional passion for public service, lifelong learning, and professional development. 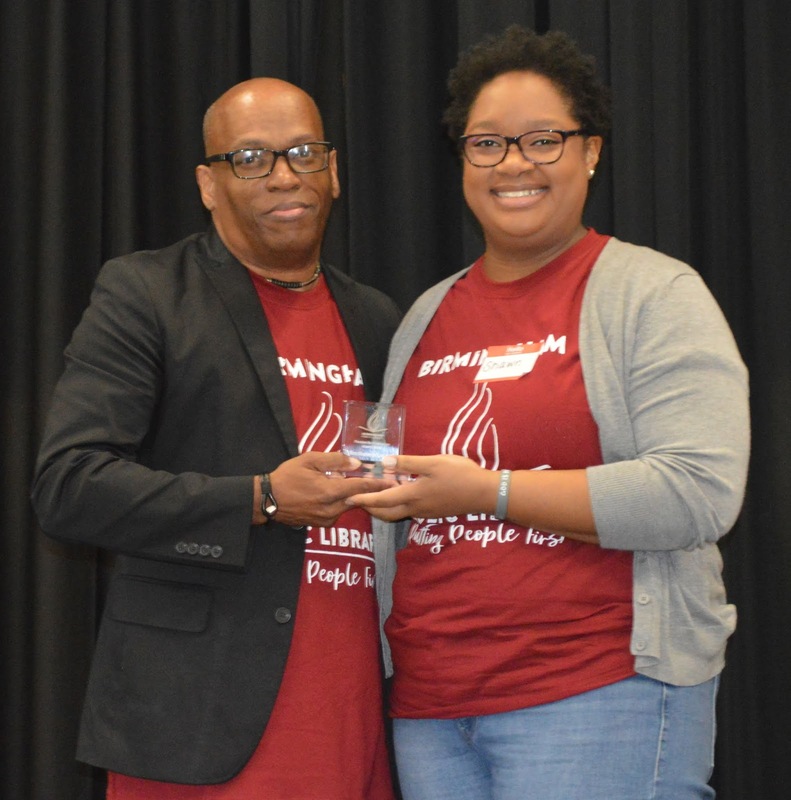 This award is for excellence in customer service, administrative support, and interpersonal communication. This award is for best community program that produces exceptional branding for the library system. This award is for 21st century technology, innovation, and strategic leadership. This award is for excellence in programming, conference presentation, or outreach to the LGBTQ and underserved communities. This award is for excellence in group project management, re-imagined space teamwork, or advancement of library user experience. This award is for demonstration of multifaceted balance and contribution to stability in a culture of organizational change. This award is for demonstration of excellence in contributions to organizational transformation. This award is for demonstration of professional commitment to staff development via professional mentorship. This award is for exceptional and consistent customer service in the provision of library security. Staff development and training is a year-long commitment at the Birmingham Public Library. From sending employees to national conferences such as the American Library Association to local leadership and management courses at the Personnel Board of Jefferson County, BPL makes giving employees the job skills needed to better serve our patrons a top priority as our 19 libraries strive at "Putting People First." 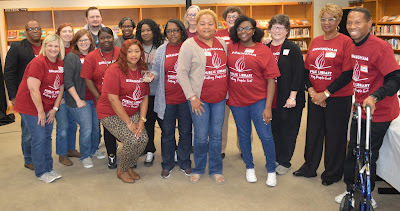 On Thursday, October 18, 2018, all 19 BPL locations were closed as our nearly 300 employees gathered at the Central Library for BPL Staff Day. 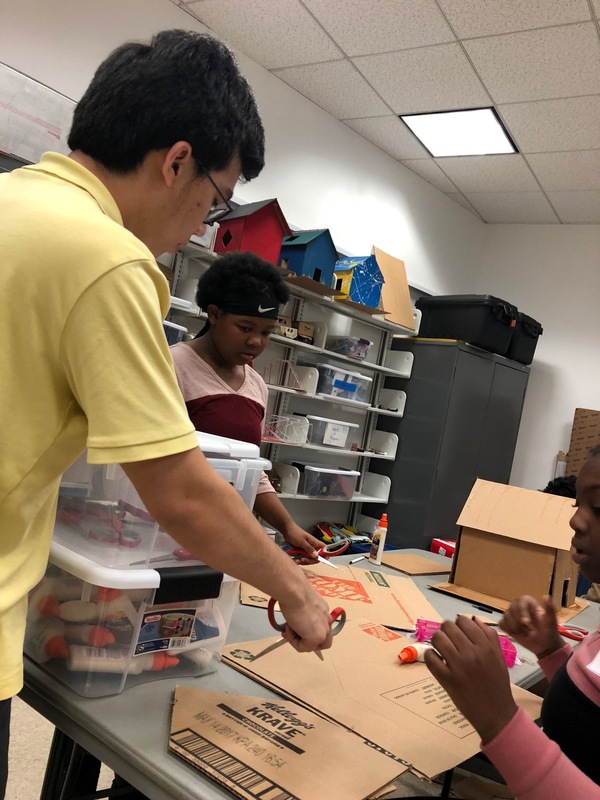 BPL is committed to staff growth and development, providing staff with "the opportunity to take formal academic courses and job-related meetings and training that helps prepare them for new opportunities and enhances their job skills." More than a dozen BPL employees attended the American Library Association annual conference in New Orleans in June, including Shawn Caddell of Eastwood Library, who shared her experience at staff day. 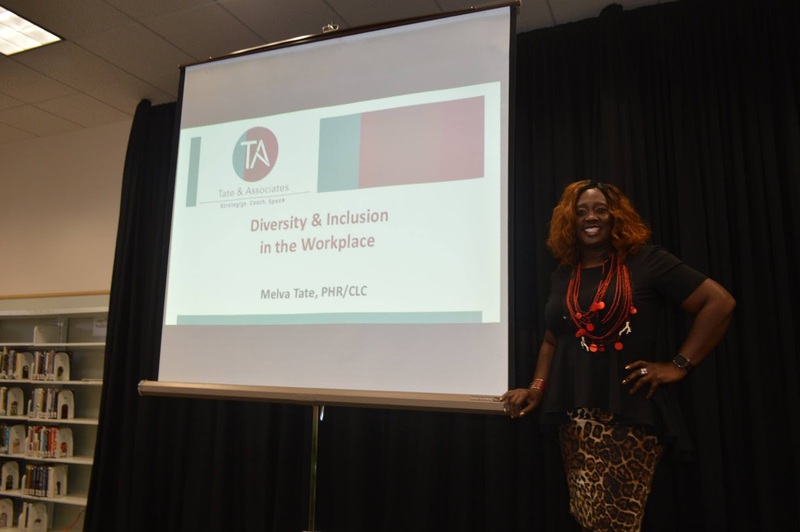 Tina Samuel, a library assistant at Titusville Library, became the first BPL employee to attend the Libraries of Color National Conference in New Mexico in September. BPL staffers also attended training events at the Urban Libraries Council, plus state and local training sessions. Stephen Black, founder of Impact Alabama, talked about the valuable role libraries play in society. His organization hosts free tax clinics for the low-income at three BPL locations every year. Ashlea Hitchcock-Francis of Grow with Google shared how impressed the company was at the response they received from businesses and individuals who attended the Birmingham kickoff of the Grow With Google Alabama tour held at the Central Library on August 6. Na’Denna Colbert, membership director of the Urban Libraries Council, discussed the impact member libraries such as BPL are having in cities across the country. 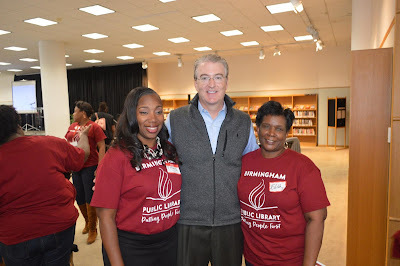 BPL rejoined the Urban Libraries Council in 2018. 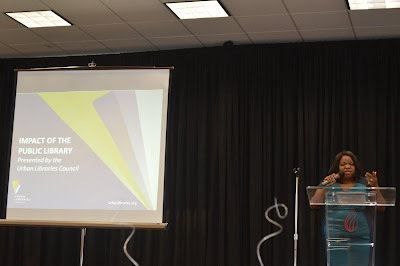 Anthony Sparks, a Birmingham development coach, inspired BPL employees in his message, “Your Piece Is Important,” which talked about how every piece of the puzzle – employees–matters. 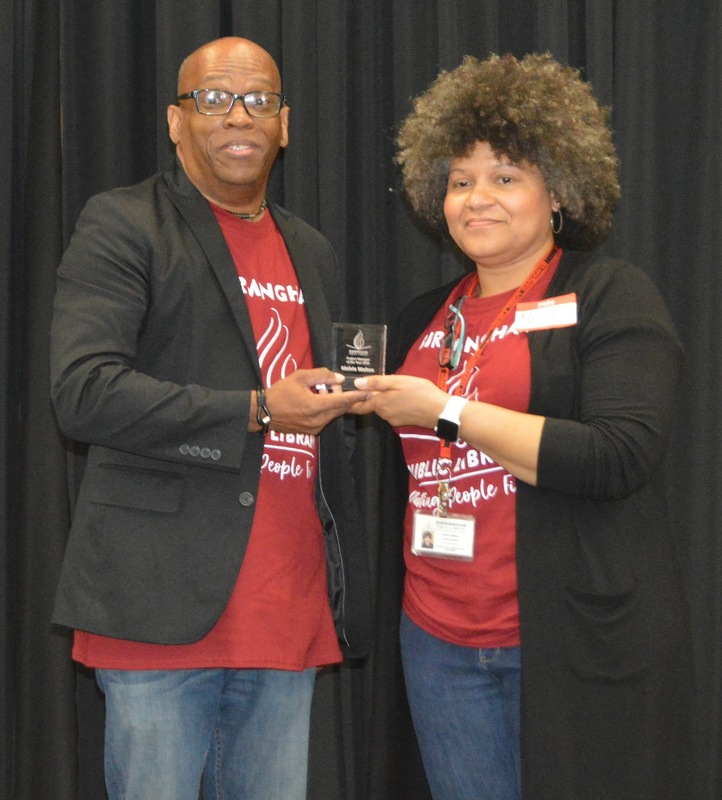 Health and Wellness: High Blood Pressure – James Gibbs, fitness center administrator for the City of Birmingham, shared tips on how exercise and reducing stress can not only lower blood pressure but help prevent diseases such as diabetes. Diversity and Inclusion – Melva Tate, a Birmingham human resources consultant, talked about the importance of having a workplace that values diversity and inclusion regardless of employees’ race, gender, or sexual orientation. Goal-setting – Vicki Morris, education training coordinator for the City of Birmingham, gave advice about how BPL employees can set realistic goals for the future and achieve success in the workplace. 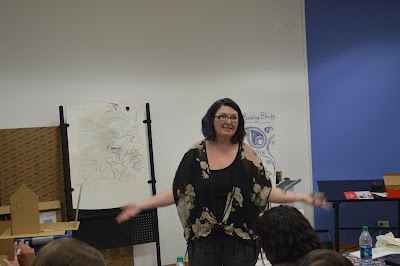 Amanda Keller, director of the Magic City Acceptance Center, led a workshop about the importance of "Providing LGBTQ Affirming Spaces and Services” for the public. Whimmmsy Natural Henna Art – September Reed, who this year hosted a popular Summer Learning activity at Springville Road Library, taught 15 employees in this workshop the art of henna tattoos. Birmingham artist Cherie Hunt taught 30 BPL employees how to tap into their artistic side by presenting Palette Party, her popular Summer Learning program that has been held at several BPL locations the past several years. View more photos of BPL 2018 Staff Day on Flickr. When: Friday, October 19, 2:00–5:00 p.m. Details: Sponsored by Alabama Civic Engagement Coalition. Topic of discussion: Voters Rights Restoration. For more information, call John Paul Taylor, a fellow of the Southern Poverty Law Center, at 334-235-6789. Do you know what your rights are as an Alabama voter as the November 6 election approaches? 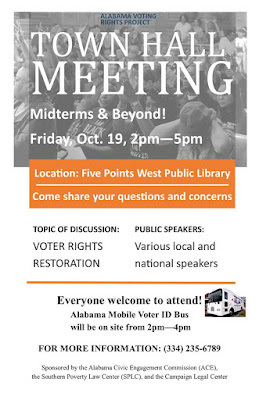 The Five Points West Regional Branch Library is hosting an Alabama voting rights town hall meeting on Friday, October 19, 2018, 2:00–5:00 p.m. 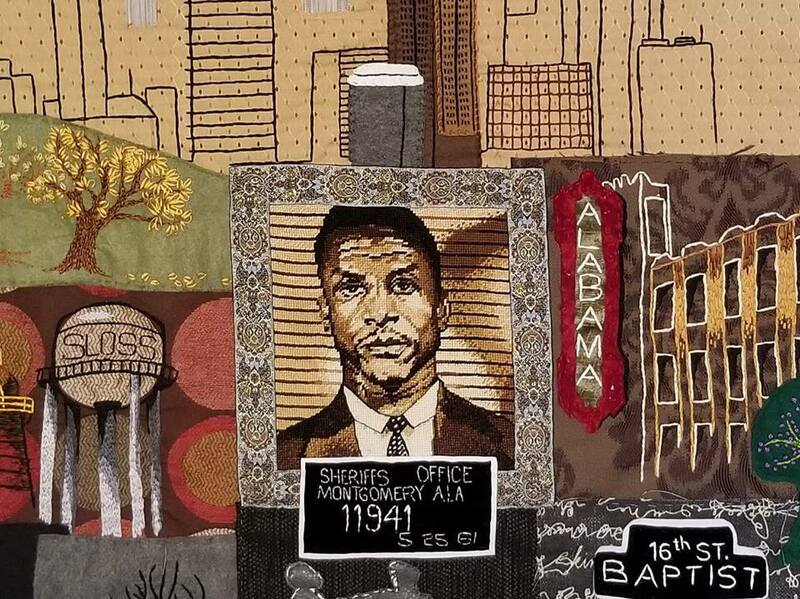 The event is sponsored by the Alabama Voting Rights Project, the Southern Poverty Law Center, the Alabama Civic Engagement Center, and the Campaign Legal Center. National, international, and Birmingham area speakers will answer questions and share their opinions about voting rights, voting injustices, and how to get the vote out during the November midterm elections. The Alabama Voter ID Bus will be on site from 2:00 to 4:00 p.m. to create free voter IDs just in time for elections. John Paul Taylor, a fellow of the Southern Poverty Law Center, will meet privately with former offenders to assist in determining actual voting status. Each meeting will last approximately 15 minutes and is confidential. Taylor recently hosted free voting rights sessions at the Five Points West Library in July and August. "Many people think that if they have a felony conviction that they can't vote; however, changes in voting laws in 2017 re-enfranchised many Alabama citizens,” Taylor said. “At the town hall meeting, we will share information on the new laws and the various paths of restoration to provide direct services for formerly incarcerated persons. The Voter ID Bus will be here as many voters have been turned away at the polls due to insufficient identification. This will remedy that." The Shape of Water is a 2017 American romantic dark fantasy drama. The movie, set in 1962 Baltimore, Maryland, follows a mute custodian named Elisa who falls in love with a humanoid amphibian at a secret government laboratory. Elisa, who only communicates by sign language, teaches the creature to communicate by sign language as well, as they develop a special relationship. Without giving too much more away, the movie shows that love comes in all shapes, sizes, and forms. The Shape of Water scored big at the 90th Academy Awards, where it won for Best Picture, Best Director, Best Production Design, and Best Original Score. Once I began watching this dark, romantic drama, I couldn’t turn away until I saw the movie’s climactic end. 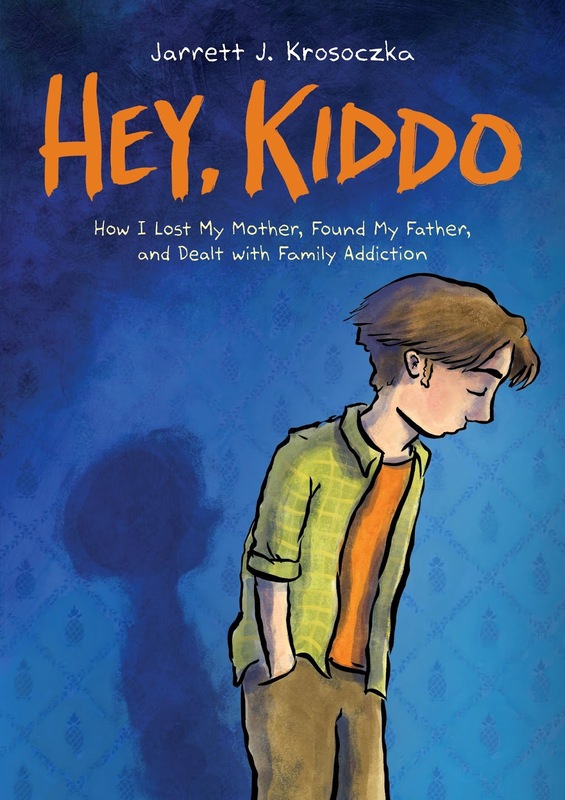 Check the JCLC catalog for the availability of the movie (or book, audiobook, and soundtrack). 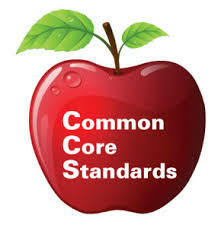 Alabama’s State Board of Education adopted and implemented Common Core Standards in November 2010. These standards have since then shaped how we approach math and language in teaching, parenting, and learning. There are a number of feeder schools to each of our 19 public library locations in Birmingham and its communities, and libraries exist for a number of reasons. One is to allow unlimited access to information, but another is to provide supplemental instruction for K-12 students, parents, and teachers alike. With the introduction of Common Core educational standards, it has become increasingly harder for parents to understand what common core means, how to maneuver strategies, and how to better equip and assist their children with school/homework. Libraries are here to assist all parties involved in this initiative and give you a clearer understanding of how you can and will succeed. Common Core is defined as a "set of high-quality academic standards in mathematics and English language arts/literacy (ELA). These learning goals outline what a student should know and be able to do at the end of each grade." Recognizing and understanding the value and need for clear and easy instruction should be at the forefront of our educational goals. How successful we are in delivering instruction and information to the children, who are our future, depends on our willingness to be open and honest about our level of understanding and how we improve our areas of weaknesses to share those areas where we are strong. Check out these resources and more on Common Core from your local library! Common Core Curriculum: United States History, Grades 3-5 by Common Core, Inc. The Birmingham Public Library (BPL) and Birmingham SCORE will be offering Steps to Starting a Franchise Business, a how-to seminar on franchising at the Central Library. The seminar will explore how franchising can take the risk out of starting your own business and becoming self-employed. 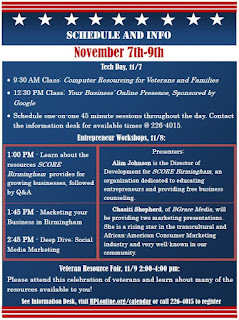 Greg Foss, a career transition coach with The Entrepreneur’s Source® and SCORE mentor, will facilitate the seminar. Topics to be covered in the seminar include: common myths and truths about franchising, the importance of knowing your personal goals before taking the plunge, non-standard ownership options, how to finance your business, how to research and select the right franchise, and resources that are available to help you with your research. The seminar is free, but registration is required. 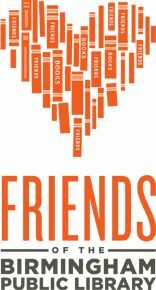 Register online through the BPL events calendar or call Greg Foss at 336-501-5695. 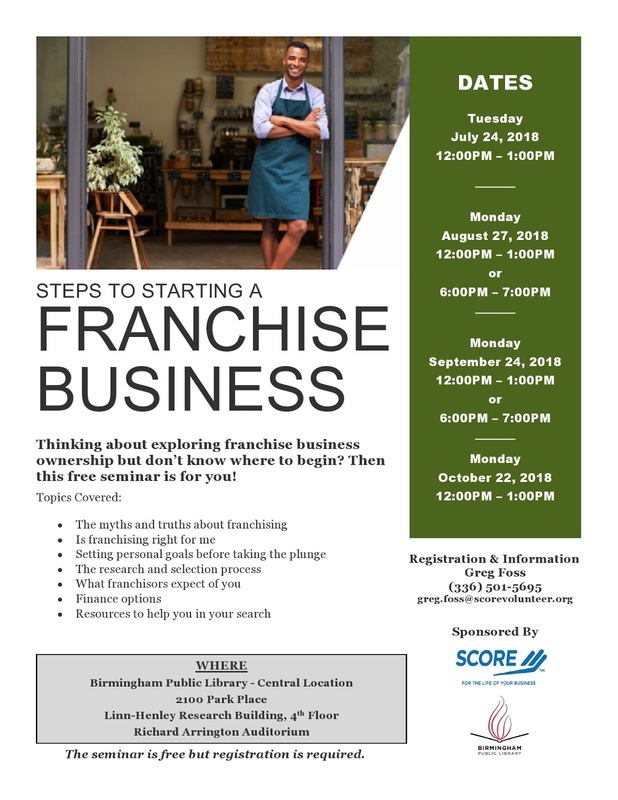 For more information about the seminar and other resources for small business development available at BPL, please contact Jim Murray of the Central Library’s Business, Science and Technology Department by email at jmurray@bham.lib.al.us or by calling 205-226-3690. Alabama State Senator Linda Coleman-Madison, District 20, has given $13,000 in community service grants to five Birmingham Public Library locations in her district. 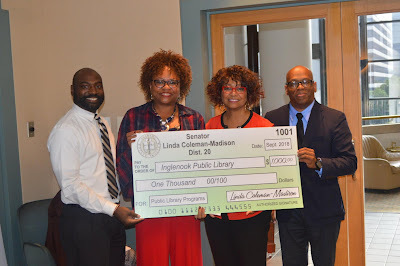 Coleman-Madison, ADA compliance administrator for the City of Birmingham, presented the checks to BPL during its Board of Trustees meeting on Tuesday, October 9, 2018. 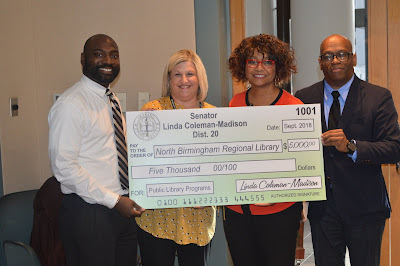 Coleman-Madison, a former Birmingham City councilwoman, said she was honored to present checks from her Senate Community Service grants to the five public libraries in Birmingham located within Senate District 20. She added, “It is our hope and desire that these funds may assist with needed materials for programs that supplement extended learning in partnership with local schools in the areas they serve. I am happy to present checks to these regional and branch libraries in Senate District 20." October 12 was a day of celebration in Avondale once upon a time. It was Miss Fancy’s birthday. Miss Fancy, the legendary Queen of Avondale, may be Avondale’s most famous celebrity. She’s the cover girl for Avondale Brewing Company, where she has a special ale named after her. A restaurant on Fifth Avenue is named Fancy’s on 5th in her honor. A current fundraising campaign is raising money to put a life-size statue of her in Avondale Park. She is the subject of a subplot in Fannie Flagg’s novel Fried Green Tomatoes at the Whistle Stop Café; a short documentary, Mr. Todd’s Fancy; and Miss Fancy, a play featured in Theatre Downtown’s 2016 season. 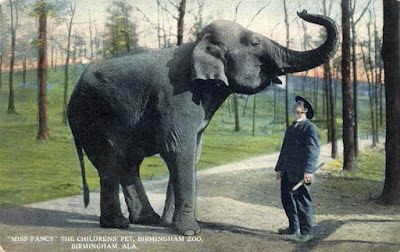 Miss Fancy (1871-1954) was a gentle Indian elephant who served as the star attraction at the Birmingham Zoo (when it was located in its original site at Avondale Park) from 1913 to 1934. She was known to routinely stroll through the streets of Avondale, Forest Park, and Woodlawn. Children loved to ride Miss Fancy; she would carry five to seven on her back at a time. She sometimes visited Avondale Elementary School, where the children would run outside to feed her their lunches. She would sometimes wander through the neighborhood eating out of her neighbors’ gardens. One little girl fondly recalled waking up to find Miss Fancy peering in her bedroom window. And soon a new generation will have the chance to meet Miss Fancy when she stars in a children’s book arriving in January 2019, just in time for Alabama's bicentennial celebrations. The author of Meet Miss Fancy, Irene Latham, will be at Avondale Library on January 13 to introduce the new book, here in the neighborhood that was once Miss Fancy’s stomping grounds. More information about Meet Miss Fancy is available at https://www.goodreads.com/book/show/29625960-meet-miss-fancy. Mr. Todd’s Fancy, a short documentary about Miss Fancy and her trainer John Todd, is available on YouTube. Some of the interviews were filmed at Avondale Library. More information about the campaign to raise money for a statue of Miss Fancy in Avondale Park is available at http://queenofavondale.com/. You can also read contemporary newspaper articles about Miss Fancy in BPL’s Digital Collections. Bards & Brews presented three cash prizes to its poetry slam winners at the Central Library on Friday, October 5. Getting judged by the audience! 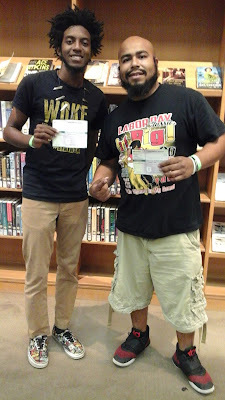 Second place ($150 check) – Jonathan Peterson of Montgomery, Alabama, who performs as "JP Da Poet"
A poetry slam is a competition using elimination rounds during poetry performances that are judged by a panel chosen from the audience. Voice Porter emceed the event. BPL hosts Bards & Brews monthly except December, usually on the first Friday evening. For more information and upcoming dates, visit Bards & Brews on Facebook or the BPL events calendar. 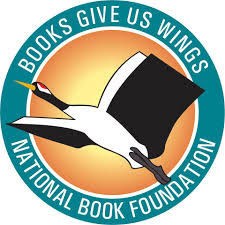 The National Book Foundation has announced its 25 finalists in five categories: fiction, nonfiction, poetry, translated literature, and young people's literature.The winners in each category will be announced November 14, 2018.